Fitness-wise, this year has been a bit of plateau for me. I’ve been doing all the “right things” – eating well (most of the time), working out regularly, and drinking lots of water – and haven’t really seen any of the results I’ve wanted to. 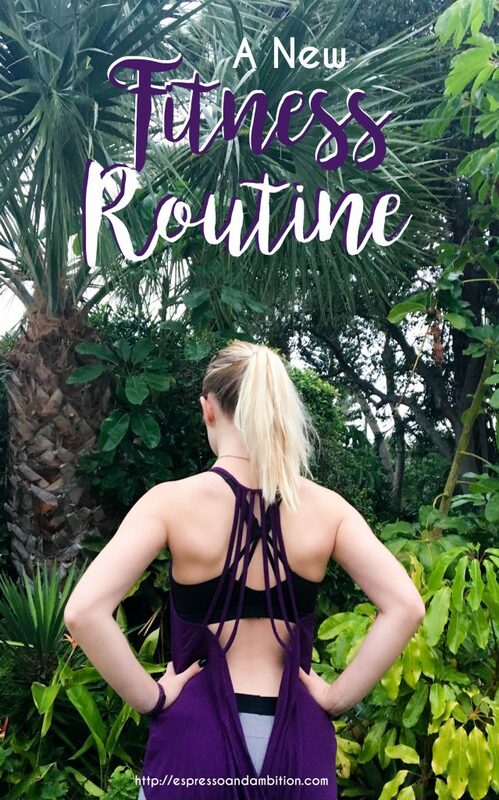 I know that it’s because my fitness routine is a bit on the lazy side – I don’t generally pay much attention to what exactly I’m eating other than that it’s not junk food (except donuts, whoops) and I’m kind of just working out to say that I did a workout for the day. This isn’t quite the right timing for a fitness routine revamp (the holidays are usually where people’s routines go off track), but I’m doing it anyways. In the past few weeks, I’ve been researching all sorts of fitness-related topics – macros, weightlifting routines, the “right” amount of cardio, all that jazz. While I definitely don’t have it down to a science, I do think I’ve come up with a plan that’s a solid step in the right direction. I’ll probably modify it as I go along and see what works and what doesn’t, but for now, this is what I’m working with. My Pure Barre membership expired a few days ago, and I ended up making the decision not to renew it. Part of the reason that I did that is because I’m interning in Atlanta part-time next semester, and all that commuting means I won’t get to work out during “normal” hours on those days. And thus, I got a membership to a gym that’s open super early and closes super late. I’ll be honest with y’all: gyms stress me out. I like to think of myself as someone who’s pretty in shape, but I always feel a little out of place walking through a gym (especially in the free weights section, where everyone’s biceps are bigger than my thighs and they all have like 5% body fat). I also hate feeling like I’m bad at something. So working out in a gym, where I feel like a complete beginner and a newbie, is way out of my comfort zone. I’m working to embrace it. I’m adopting a “push, pull, legs” rotation to my workouts so that I’m getting shoulders/chest/triceps in one day, back/biceps in the next, and legs/glutes on the last day. I’ve heard good things about this particular split, so we’ll see how it goes. I’m also tacking cardio onto the end of each workout – whether that be rowing, running, or stair climbing. Because I’m the type of gal who heavily researches everything, I’m really trying to research the best exercises to do, how much weight I should be trying to lift (answer: not much, because I have zero upper body strength), and all that jazz. I’m also going to start recording all of my workouts on the Notes app of my phone, and may or may not start uploading them to social media. If I do, I’m thinking either Insta stories or Twitter, but who knows. I’m three days in and all I can tell you is that it’ll be an adventure and a new experience, that’s for sure. So I’m adopting the trendy gym-goer diet of tracking my macros. I already knew that I didn’t get quite enough protein, but I never really noticed how little I was actually getting until I started tracking it. Since I don’t eat meat, it’s so easy to accidentally go a whole day eating basically nothing but carbohydrates. Right now, I’m aiming for about 35-50% protein, 25-45% carbohydrates, and 20-35% fat, with somewhere around a 500-calorie daily deficit since my ultimate goal is to lose a few pounds. I’m hoping this will make me a little more intentional about what I eat. Instead of just counting calories, I now have to think about how each of those calories is fueling my body. I’m also having to go out of my way to ensure that I’m getting enough protein (hello, protein shakes!) and maybe chill out on the carbs just a little. To be honest with y’all, there’s a good part of me that’s doing this for the spring break bod. I’m going on my first “real” spring break trip since freshman year, and I’d love nothing more than to look toned and ~on point~ for that trip so that I can enjoy my daiquiris by the pool guilt-free. But I’m also hoping that maybe this will turn into a lifestyle thing and I can officially categorize myself as one of those “fitness people” that I so often enjoy stalking on Instagram. Wish me luck! If you’ve got any advice or are looking to revamp your own fitness routine, be sure to let me know in the comments. Gyms intimidate me too, I NEVER know what to do! I’d love to see those posts on Twitter so we can always go back to them 🙂 Best of luck, you got this!! I used to hate going to the gym for the same reason! I have a gym in my apartment building and I’ve found that going really early in the morning when no one is around makes it a bit easier, if that helps?